I was sent this quote by a man who studies rock art. He has a penchant for graffiti. And pavement art. It’s possibly significant that when he sent me this he was in San Francisco, though he’s actually from South Africa. So I suspect there was a bit more going on than – possibly – a provocative suggestion that decorative graffiti is useless. I’ve been seeing some art lately and wondering about usefulness. Mondrian and his studios. The artist famous for distilling the essence of things into lines and colours. I thought I understood it. A day or two later I realised I didn’t. I look at his work and like what I see. Grayson Perry’s tapestries. ‘The Vanity of Small Differences.’ The man, with his alter-ego, Claire, is almost a work of art himself. I’d visit again and again if I could – though I wouldn’t want to live with them. They’re a moral tale for our times – for all times. These brushes with art set me thinking. And right on cue for long thinks, we snatched a few days of anti-social-media time. No email, blogging, Facebook, Twitter – nada. I like maps. You never know what you’ll find down those wrong turns. And we know how to find Aberdaron. It’s a seaside settlement, right at the end of north Wales. The village is grey. Stone grey, slate grey. White paint relieves the many shades. 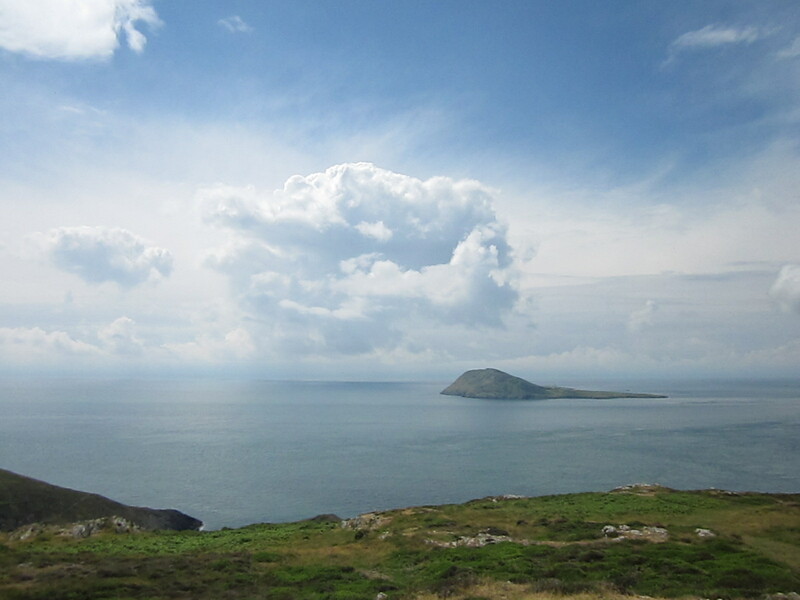 Pilgrims have for years arrived here, en route to Bardsey, isle of 20,000 saints. A long, sandy beach laps-up the sea. On a good day the oh-so-white clouds and the brilliant blue sky lift your soul straight up to heaven – no need for a perilous pilgrimage, braving the seven currents that gate-keep the island. 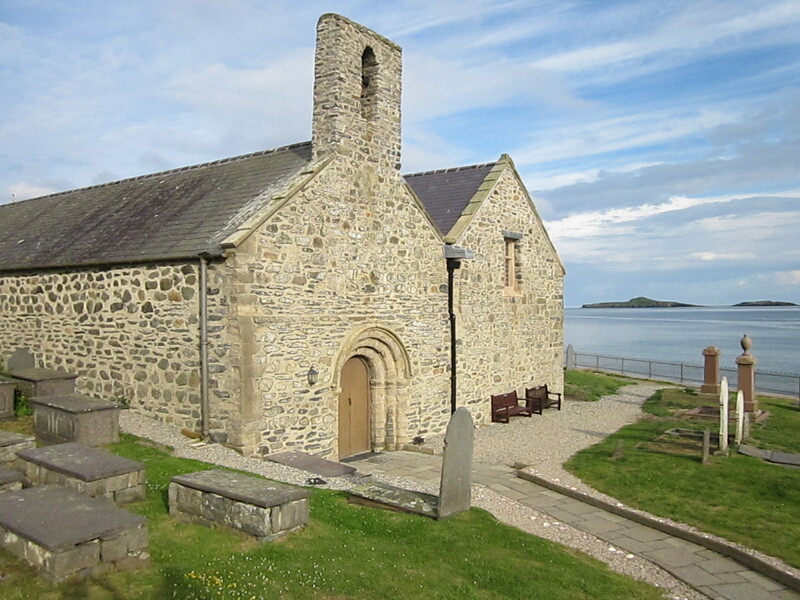 In a simple stone chapel on the edge of this Welsh-Wales world, RS Thomas – poet and priest – cared for local souls. Facing the church are cottages. Old and small. Thick stone walls and tiny windows. It’s a place to keep the sea out, not ask it in for tea. Years of being a small, hard-pressed community, battling the elements to wrest out a living, have created a cohesion, both visual and human. But since our last visit things have changed. A cottage on the hill’s been renovated. Big, blind-looking picture windows gash the front. The corrugated iron shack that housed the local bakery has gone. 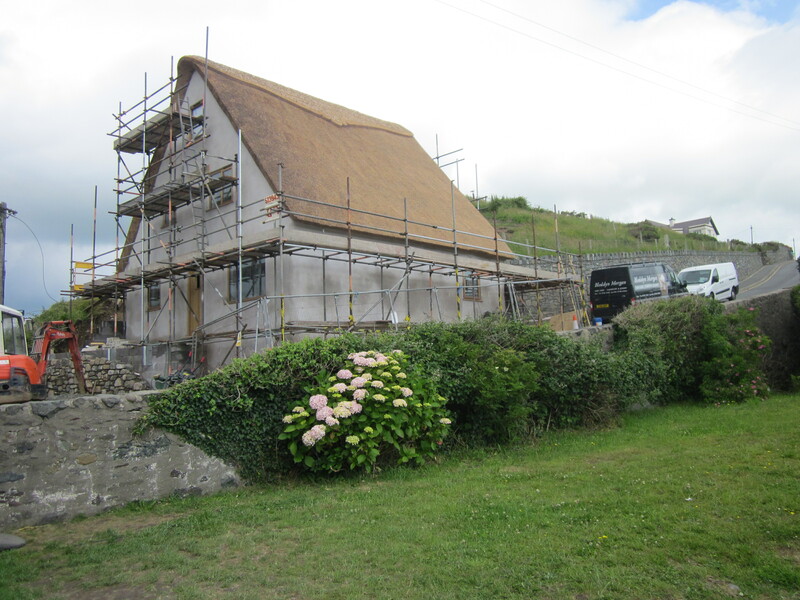 A new – thatched – building has taken its place. ‘The only thatched bakery in the country,’ says the proud owner. Indeed. And the only thatched roof in a village of slate. But – the bread’s still good. And the National Trust has built a Visitor Centre. Awash with art and poetry, it’s a brave – or foolish – departure from ‘interpretation’ as we know it. Though there are many words. 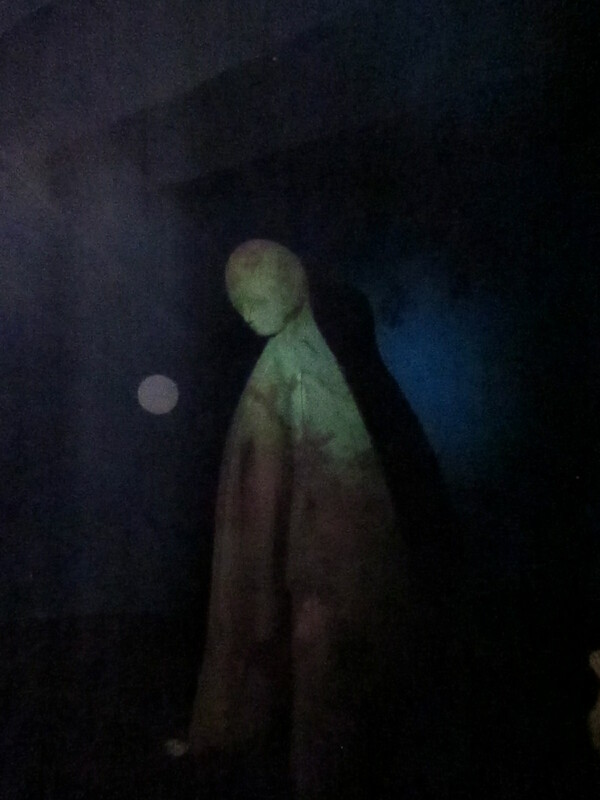 Words on the audio guide, words in the air, words on the artefacts, words on the wall. Colourful collages of local geology. Poetry. No actual information. Some ‘artefacts’. Agricultural ephemera. Words painted on each item. Even the pebbles (in case you can’t make it to the beach?) are worded. But there’s respite from the words. Bright shopping baskets. Nautical stripy tops. The usual scented soaps – and mugs – and figurines. The land – apparently – cost £1.5 million. The art-farty, factless exhibition a mere £950,000. It swallowed 60 much-needed parking spaces – for what? 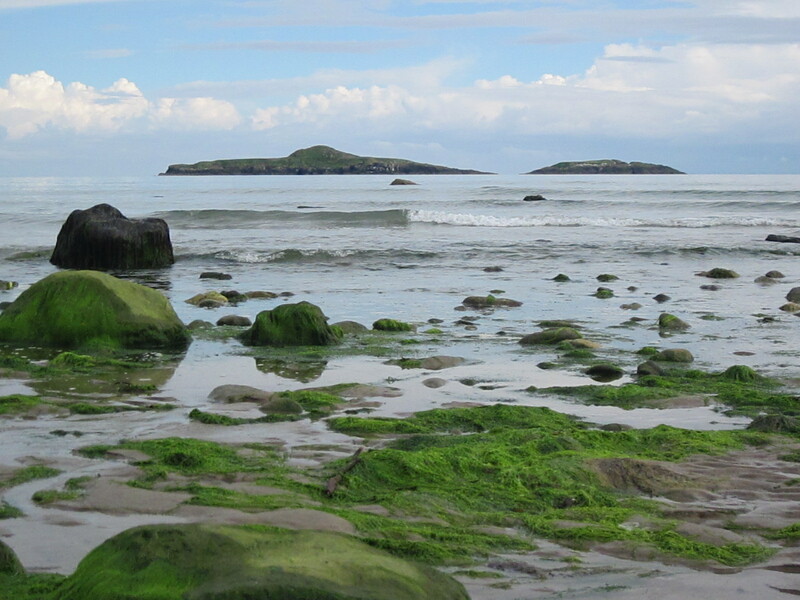 The windows, the bakery, the Visitor Centre all feel out of place and – for me – have ever-so-slightly spoilt Aberdaron. Sometimes, though, what makes us uncomfortable makes a point. Grayson Perry’s work, for example, is far from comfortable, but makes me think. 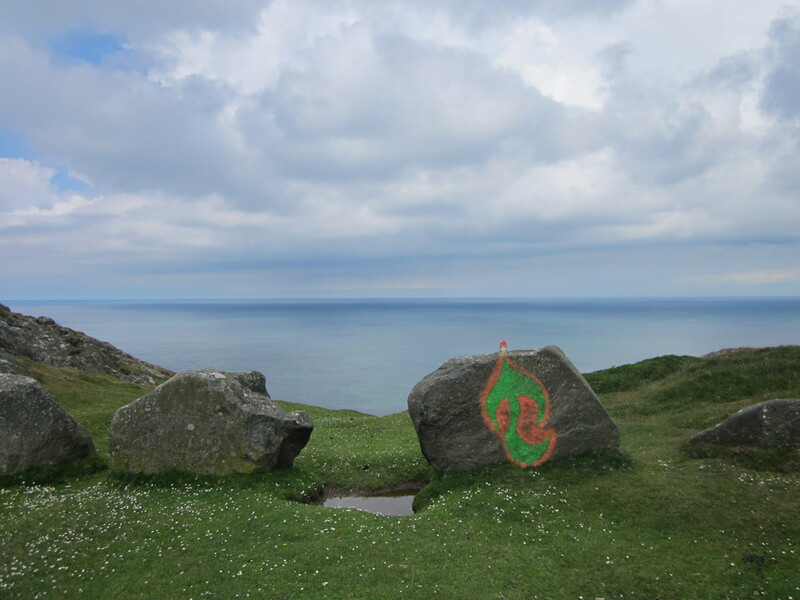 Graffiti on the headland above Bardsey could – arguably – do the same thing. But it doesn’t. It says nothing to me, except, what a lovely view you’ve spoiled. I don’t understand its language, if it has one. Back in the village, chatting with a local woman, I mentioned the windows. The same person, she says, undermined a whole row of houses by digging out the sand beneath the house for a wet room – or something equally life-improving. Perhaps uncomfortable aesthetics are a symptom of something more profoundly wrong. Like spots are of chickenpox. The Centre, the thatch, the windows aren’t going to bring down a government. Let alone a local council unconcerned about its own conservation areas. But one of them could – will – bring an end to my National Trust membership. That vacuous Centre is just what this tip of Wales doesn’t need. It needs parking spaces. Information for tourists in summer. A space for the community to gather in winter. I’m told a promised community space has not materialised. But then, this wasn’t for the community was it? Let’s hope the long journey from London doesn’t put off the target market. What’s that? An H for the helicopter? 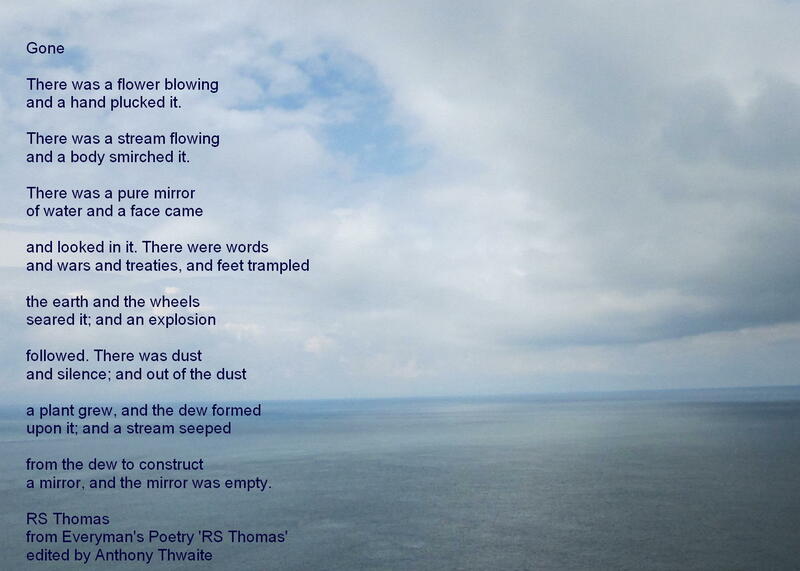 This entry was posted in Art, jaunts & going out, Llyn Peninsula, Thinking, or ranting, or both and tagged Aberdaron, Art, Banksy, Bardsey, graffiti, Grayson Perry, Mondrian, National Trust, pilgrims, Poetry, RS Thomas, Wales. Bookmark the permalink. There are no shortage of Banksy quotes… and he answers his own question. But if as the quote from Beverly Sills says… “Art is the signature of civilizations.” it’s a useful legacy, and ultimately history decides what art is. Great quotes. I am ambivalent about graffiti – well, that said, it depends for me on context. We lived in Bristol, home of Banksy, for several years and I loved his works there – the teddy bear with the bomb, etc. They worked where they were. I’ve seen ancient rock art ‘vandalised’ by day-glo spray paint – and while I can see that at some point it may say something of its own (like graffiti from long-dead poets that now seems interesting) , it is also destroying something precious. I can feel myself straying into dangerous territory here – I’m not an art historian, never studied it, don’t know enough to be an intelligent critic – even as I write I think – do I mean that, am I just culturally brainwashed? Thnking back to a visit to a slaving fort in Ghana that is decaying rapidly and westerners would want preserved, I think, why? My dad was a historian and an architecture fan and wrote about castles, houses and abbeys – to him conservation was important and I guess I grew up with that attitude too. History decides what art is? Hmm. All I can add to that is a question – what if it’s the buyers and sellers who make that choice by preserving it and making it valuable? It’s still a process of rather arbitrary selection – Tracey Emin’s bed versus David Hockney’s Grand Canyon, for example. Sorry, very British examples. Did you look at the Grayson Perry tapestries? Graffiti for mine is destructive, disrespectful and unwelcome. For street art I pause, linger and wonder, walking away brighter, enriched, at no cost, although some street art is now valuable, collectible. My thoughts are that buying, selling, collectability of contemporary art or something that may one day be art, don’t necessarily inevitably render it truly art (possibly only in those terms), or by their absence not. I looked at the tapestries, which I was wrong (happily) in assuming would be hunting or religious themes, etc. I really must update my word associations. They were interesting to see on the screen, and would be amazing in real life. A late contribution. I’m glad you ride a bike. Extract from an email to my son a couple of days ago: “Here it’s hot again so any work in the garden has to be done early in the morning, though not every morning, this morning for example I went for an hour and a quarter’s bike ride. That precision is not because I say to myself “I must go for an hour and a quarter’s ride this morning”, but because of the particular point on my regular route that I’ve worked up to which takes that long. The wheatfields, blue green lot long ago, have already been reaped, some of them were head-high, and the maize is getting high (not yet quite as high as an elephant’s eye), green fields of proso millet (just looked that up on wikipedia, looks like droopy-headed grass with lots of tiny seeds like sesame) almost ripe, and the cherries have all gone by now. But yesterday morning I went for a walk and there are going to be heaps of big juicy blackberries this year and earlier than usual, there are already a few ripe ones and I came back with purple-stained finger and thumb. We too have blackberries bursting out all over – I’ve also discovered that a butterfly we have seen in our garden (of which more at some point) feeds on the flowers of the bramble – it’s great putting nature’s twos and twos together. Cherries from England have been rare in recent years but this year there seem to have been bumper crops in Kent and I am revelling in it as I love fresh cherries. They stir a memory from the summer of 1967 (‘All You Need Is Love’ summer) as a child standing on a boat on the Moselle spitting cherry stones into the river … I’ll stop there, I feel a memoir coming on!